Before RTE struck gold with Bill and the three amigos, ITV assembled one of the great football punditry ensembles of all time. The broadcaster revolutionised the genre after England's 1966 World Cup victory made the rights for the '70 edition hot property. Brian Moore introduced proceedings as Pat Crerand, Bob McNab, Malcolm Allison and Derek Dougan squabbled and bantered, often while Allison smoked a cigar. Four years later, it got even better, with Brian Clough and Jack Charlton replacing Crerand and McNab. Jack made an instant impact, fighting with Dougan over a supposed foul during the tournament, with a very smug Charlton backed by the majority of the viewers. That same programme invited requests from viewers via postcards along with throwing open the phone lines, with Brian Clough treating one Italian caller with his unique, dismissive charm. ...which was followed in 2010 by this one-upmanship against Patrick Vieira and Fabio Cannavaro. While Sky Sports are usually credited with the technological revolution in TV broadcast studios, RTE were ahead of the curve with the Microsoft Word-style, er, stylus Dunphy and Giles used to scribble on the screen. 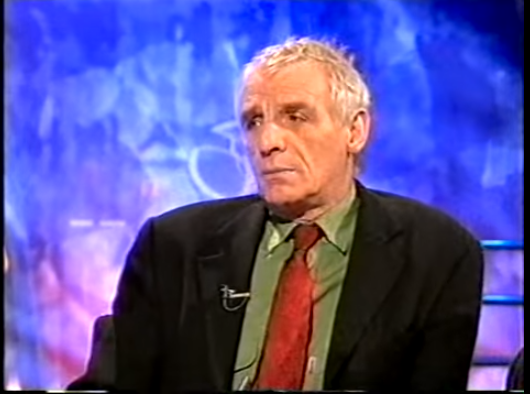 Dunphy used it to memorably superfluous effect in analysing Rudi Voller's spit at Frank Rijkaard during Italia '90, using the stylus to track the spit's trajectory, exclaiming "There it is, Bill, it’s hitting his head there. And that’s bad news for Rudi Voller and even worse news for his hairdresser!" We couldn't not include it. Dunphy was Roy Keane's staunchest defender during Saipan, to such an extent that he rocked up to Montrose wearing Cameroon colours ahead of Ireland's opening game against...Cameroon. Okay, it was the Euros, but the greatest TV moment of the decade starred Steve McClaren and we just couldn't resist the urge to post it again. See Also: Joxer Goes To Stuttgart - Where Are They Now?